Around the globe, the vast majority of businesses are owned and controlled by families. The U.S. Bureau of the Census estimates that about 90 percent of American businesses can be defined as family businesses, which includes approximately 35% of Fortune 500 firms. Family businesses are an important engine of the U.S. economy, accounting for half of the nation's employment and half of the Gross National Product. Outside of the U.S., and particularly in emerging markets, family businesses’ contribution to their country’s economy are often even more significant. 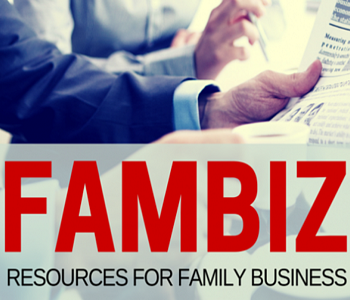 Our goal at FamilyBusiness.org is to help these firms thrive by providing a free online resource that offers them the best thinking on how to launch, manage and grow their family business, all in one place. We aim to teach and inspire current and future family business owners, students in entrepreneurship programs, and professors and advisers who guide them. FamilyBusiness.org delves into the unique opportunities and challenges faced by family-run firms, including managing complex family relationships, innovation, wealth management, and succession. We recognize the synergies that exist between families and their businesses, and the need to foster both healthy families and healthy businesses for the long-term prosperity of these unique businesses. Our Founding and Senior Editors are Professor David Deeds, Schulze Professor of Entrepreneurship and Director of the Morrison Center at the University of St. Thomas, and Professor Kimberly Eddleston, Schulze Professor of Entrepreneurship at Northeastern University. David Deeds has substantial experience in helping businesses remain entrepreneurial and innovative, and he was central in the successful launch of Entrepreneur and Innovation Exchange (eix.org). Kimberly Eddleston is renowned for her research on family businesses, which is often inspired by her experiences as a stakeholder in several of her family’s businesses. Launched in June 2018, Familybusiness.org is an offshoot of Entrepreneur and Innovation Exchange (eix.org), a social media learning platform whose goal is to dramatically improve the success rate of new business ventures. Dedicated to entrepreneurship students, professors and entrepreneurs, EIX is philanthropically funded by the Schulze Family Foundation, established by Best Buy Founder and former CEO Richard M. Schulze. Like familybusiness.org, EIX.org is a free resource designed to advance and share the best research and practice of entrepreneurship, and make it relevant and accessible to both aspiring and practicing entrepreneurs. Both EIX.org and FamilyBusiness.org feature practical resources by academia’s foremost professors and other experts. Video interviews with successful entrepreneurs, advisers, and family business owners are also available. The content of both EIX.org and FamilyBusiness.org aim to assist business owners, as well as those who educate and guide them, create strategies to achieve long-term entrepreneurial success.